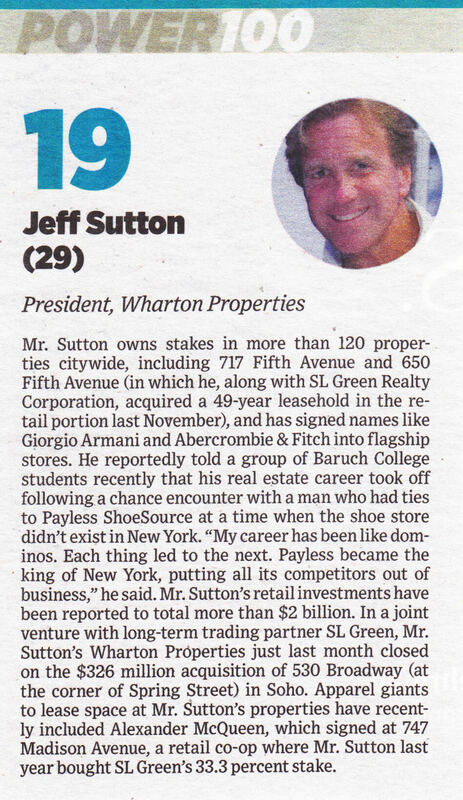 Mr. Sutton owns stakes in more than 120 properties citywide, including 717 Fifth Avenue and 650 Fifth Avenue (in which he, along with SL Green Realty Corporation, acquired a 49-year leasehold in the retail portion last November), and has signed names like Giorgio Armani and Abercrombie & Fitch into flagship stores. He reportedly told a group of Baruch College students recently that his real estate career took off following a chance encounter with a man who had ties to Payless ShoeSource at a time when the shoe store didn’t exist in New York. “My career has been like dominos. Each thing led to the next. Payless became the king of New York, putting all its competitors out of business,” he said. Mr. Sutton’s retail investments have been reported to total more than $2 billion. In a joint venture with long-term trading partner SL Green, Mr. Sutton’s Wharton Properties just last month closed on the $326 million acquisition of 530 Broadway (at the corner of Spring Street) in Soho. Apparel giants to lease space at Mr. Sutton’s properties have recently included Alexander McQueen, which signed at 747 Madison Avenue, a retail co-op where Mr. Sutton last year bought SL Green’s 33.3 percent stake.